Smart styling, compact size and exceptional performance combine to make the Sangean ATS-808 a favorite. Coverage includes long wave, medium wave, all shortwave and FM (stereo to headphone jack). Five tuning methods: keypad entry, auto scan, manual scan, memory recall and manual two-speed rotary tuning. The attractive tri-colored LCD display shows: frequency display to 1 kHz, signal strength, memory status, dual UTC-local clock and band. A wide-narrow selectivity switch really helps in the crowded shortwave bands. This radio is an excellent performer. It is a strong choice for anyone wanting a compact full coverage portable, but does not need Single Side Band (SSB). It is very sensitive and has a very smooth manual tuning knob. The leftside of the radio has: earphone jack (3.5 mini), external antenna input jack (3.5 mm mini) and the 6 VDC input jack. There is also a switch for DX-Local Sensitivity and Wide/Narrow Selectivity FM Stereo/Mono. 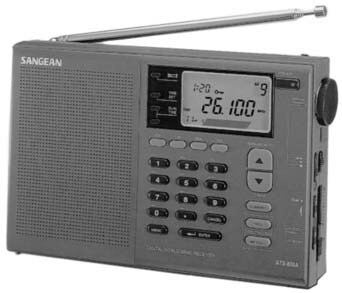 The right side of the radio has: volume, manual tuning knob plus switches for tune fast/tune slow/lock, radio lock, radio/buzzer, tone high/low and MW step 9/10 kHz. This radio boasts a large 45 memories. 7.75 x 4.5 x 1.5 inches 2 lbs. (200x115x40mm 900g). This model includes stereo earphones and case. Requires six AA cells or ADP-808 AC adapter (both optional). Copyright 2004-2017, Universal Radio, Inc.